EDIT: the pollster has corrected an error. 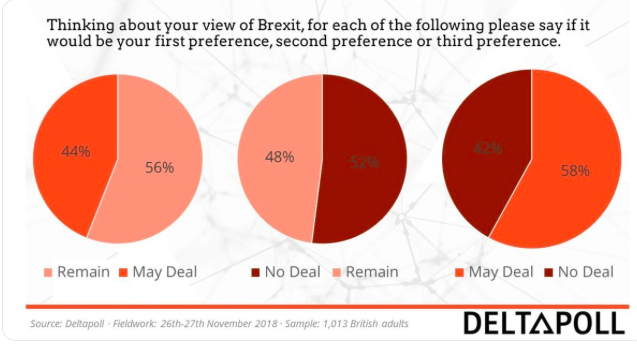 May’s deal is a Condorcet winner after all (i.e., it would beat either of the other options in one-on-one competition.) The Delta Poll blog post about the poll has been corrected, without any indication of the previous error, although its author did note the error on Twitter. The first pie diagram in the image has the numbers reversed. Sometimes it just really is awesome to be a political scientist. You see, we have a large literature on the theoretical problem of preference cycles. But they don’t ever happen in real life, right? Turkey will go to the polls on April 16th, to vote on a set of constitutional amendments which would change the country’s system of government to presidentialism. Though it seems that in Turkey, the current system is generally referred to as ‘parliamentary’, Turkey has actually been semi-presidential (specifically, premier-presidential) since the country’s first direct presidential election was held in 2014. The amendments passed the three-fifths legislative majority necessary to put them to referendum with support from the Nationalist Movement Party (MHP). Introducing presidentialism has long been president Erdogan’s express wish. The idea has apparently been around in Turkish politics for a while before it was adopted by the Erdogan and his party, AKP. Full presidentialism seems to have been ‘plan A’, so introducing semi-presidentialism (passed in 2007, entering operation in 2014) was perhaps only ever meant as a way-station toward this goal. As stated above the president is already elected directly, specifically using a two-round system. The president is to become both head of state and head of government, with the power to appoint and fire ministers and the vice president. There is no requirement for the Grand National Assembly to confirm appointments. Executive office is incompatible with assembly membership. Interpolation of ministers is to be removed from the constitution, leaving MPs with written questions. The president is to have veto power over legislation, subject to absolute majority override in the assembly. He is to have the power to issue decrees in “matters concerning the executive power” and regulations “to provide for the enforcement of the laws, provided they are not contrary to them”. These cannot affect fundamental rights, except under a state of emergency; an emergency can be declared by the president without confirmation by the assembly, but the latter must be notified immediately and can shorten or end it at any time. These decree powers are essentially the same as those currently held by the cabinet. The president would also dominate the budgetary process: the complete budget is to be proposed by the president and put to a straight up-or-down vote in the assembly without possibility of amendment, with failure to adopt a budget within a timeframe leading to continuation of previous arrangements. The assembly’s term in extended to five years (from the current four) and legislative and presidential elections are to be held concurrently. If the presidency becomes vacant, fresh presidential elections must be held. If parliamentary elections are due within less than a year, then they too are held on the same day as early presidential elections; if the parliament has over a year left before its term expires, the newly elected president serves until the end of the parliamentary term, after which presidential and parliamentary election cycles are held concurrently again. The president is to be limited to being elected twice, but there are some exceptions, the first of which is that a mid-term vacancy-filling election doesn’t count towards the total. The current presidential power to dissolve the assembly is retained, in addition to a new clause which enables the assembly to dissolve itself, by three-fifths majority vote – in either case, fresh elections are held for both president and assembly, who serve new five-year terms. Early concurrent elections triggered by the assembly can always be contested by the president. The president or any member of the executive is indicted by two-thirds majority in the assembly (upon which many powers, including dissolution, are suspended), which takes the decision on removal to the Supreme Court. A president which has thus been removed is ineligible for re-election. The acts of the president, previously protected, are now to be subject to judicial review. The structure of the judiciary will not change much – with the role of the president in appointments remaining quite strong. Of the Council of Judges and Prosecutors, the president is to appoint 6 and the assembly is to appoint 7 (4 of whom must be judges from the highest courts) – for renewable four-year terms. The Council appoints most (two-thirds to three-quarters) of the judges of each of the highest courts, with the rest being appointed by the president directly. According to the BBC, Erdogan claims that the new system will ‘resemble those in France and the US’. There is clearly little truth to this. First of all, France is semi-presidential, specifically the premier-presidential variant. This means that the prime minister, while appointed by the president, can formally only be removed by the assembly – in other words, what Turkey has now. These amendments would outright abolish the prime ministership and parliamentary responsibility, granting the president (already in a position to play a dominant role in the country’s government) absolute control over the executive branch. Does that mean that the new system will essentially be the same as the US? Not really. Presidential or not, the proposed system includes numerous features bearing little resemblance the American model of checks and balances. The amendments would invest the Turkish president with extensive constitutional decree powers, allow him to all but dictate the budget, but on the other hand leave him with a substantially weaker veto than the US. The absence of assembly confirmation vote for ministers, not to mention presidential dissolution power, are also alien to the US constitution. Overall, the proposed institutional framework is to bear far greater resemblance to past and present constitutions of Latin America, where assembly confirmation is non-existent, emergency and decree powers are common, while some of the other institutions in question have featured occasionally, e.g. presidential dissolution power (Ecuador, formerly Chile and Argentina) and weaker veto (Brazil, formerly Venezuela). In any case, the proposed amendments represent an immense consolidation of power in the hands of president Erdogan. It would probably allow him to serve beyond the supposed limit of two five-year terms. Judicial appointments involve a somewhat greater degree of presidential influence over a judiciary that has already lost a great deal of independence in recent years. Judicial review, needless to say, will not amount to much. Furthermore, the requirement for judicial ratification may leave impeachment ultimately toothless even in the unlikely event that the requisite majority were achieved in the assembly. Meanwhile, the weak veto and the assembly’s own (weaker) power to call early elections is unlikely to provide much balance in practice. Though dissolution would entail new elections for both president and assembly, a president armed with the power to dissolve the assembly still seems more likely to have the upper hand in the exceptional situation his party ever lacks a majority there – exceptional because of the country’s majoritarian system, and because the president’s very power of calling early elections enables him to do so opportunistically, as Erdogan did in 2015. The Venice Commission’s report characterises the proposed changes as “a dangerous step backwards” for democracy in Turkey. It certainly feels hard to disagree. One might add (as the Venice Commission does) the fact that elections will be concurrent, which is certainly true, though, as we have recently seen, it’s certainly possible (though still uncommon) for countries to elect a president in the second round that was not of the legislative majority elected concurrently with the first round (e.g. Argentina, Peru), while more generally, two-round systems cause vote fragmentation in the first round. If elections in Turkey remain competitive, it may be that the two round system will, in the long run, cause fragmentation which will spread to the assembly. Perhaps more likely is that once in a while, the concurrent elections could result in divided government as in the first scenario I mention here. A situation like that might provoke Linzian scenarios, but is probably most likely to simply result in early elections at some point, whose outcome would most likely be a reversion to the regular unified control. Canada’s New Democrats are now willing to support a referendum on electoral-system change, “if it means consensus among parties” on the parliamentary committee, which is to report on Dec. 1. Previously, the NDP and the Liberals and other advocates of reform have been opposed to a referendum, either because they consider the Liberals’ platform pledge (and that of the NDP and Greens) a sufficient mandate for change, or because they fear a referendum can’t be won . Or both. The Conservatives, on the other hand, have consistently said such a big change must not happen without a referendum. Presumably they think they can defeat it. The above-linked National Post story refers to this as not “the first time the NDP appeared to have out-maneuvered the Liberals on the electoral reform file.” This remark refers to the NDP having successfully forced the Liberals to make the composition of the committee reflect the parties’ shares of the popular vote instead of their shares of seats. The Liberals have a (manufactured) majority of seats, and the norm for committees is generally proportional representation according to seats. At the time, I thought the Liberals’ concession to their not having a majority was a clear case of “act-contingency”–not wanting to appear opposed to a potentially popular concept of reform, whatever their sincere preferences on their platform commitment once they (surprisingly) won a majority of seats. However, in recent weeks, I have thought that the non-majority on the committee was opening up a “perfect” opportunity for the Liberals to declare, “sorry, we tried, but could not get cross-party consensus”, and let the status quo remain. The NDP move may be an effort to head off that outcome and take their chances with a referendum. They might need to get a deal with the Conservatives to make it work. That may not be quite as far-fetched as it seems. Both parties actually could benefit from a moderate PR system. For the NDP, usually the third-largest party nationally, the appeal of PR is obvious. For the Conservatives, the benefit would be from allowing the party’s disparate wings to appeal separately, either as factions competing within small multi-seat districts* or eventually as separate parties, as they were not so long ago. The next several weeks may determine whether electoral reform can advance, at least to a referendum, against what remain pretty formidable hurdles. Prince Edward Island could vote on electoral reform. Again.